People intuitively use the word network with a remarkable consistency that continues to surprise us. The idea evokes a clear, simple mental model, a structure of points or circles and connecting lines—nodes and links, vibrant with purposeful activity. Things get fuzzy when describing how a network or virtual team actually does anything coherent, how it moves in time. something as distributed as a network and something as immediate as a virtual team—people linking with purpose over time. The principles are the basis for a simple, practical methodology that has been honed over two decades. 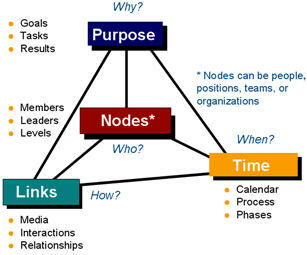 The network principles also interrelate as a systems model, offering a dynamic framework for both understanding and practice.